Asha: I pursued my Bachelor’s in Business Administration (BBA) in Finance at The George Washington University in Washington, DC. Following graduation, I developed a career leading strategic, financial and operational initiatives in the private, governmental and philanthropic sectors. I saw the value of applying innovative solutions across sectors and their ability to strengthen governance, improve education, and transform lives. Accepted: Where did you attend business school? When did you graduate? Asha: I enrolled in and completed the MIT Sloan School of Management’s Sloan Fellows Master’s in Business Administration (MBA) Program for 2016-17. This full-time, in-residence, 12-month MBA program prepares global mid-career executives with the management skills to magnify their impact as leaders. My cohort of 110 students hailed from 35 countries (76% from outside of the US), with an average of 14 years of work experience. Our core classes and seminars focused on global perspectives, innovation and leadership. Accepted: What have you been doing since graduation? Asha: In the final weeks of school, I was honored to be nominated for the three-year volunteer role of Class Communicator, along with three other Sloan Fellow classmates. Also, I was unanimously elected as a Member-At-Large on the Board of Directors for the MIT Sloan Club of DC. Since graduating in June, I relocated to Buenos Aires, Argentina to continue on the entrepreneurial journey to better understand the Latin American market. With my sharpened toolkit from the Sloan Fellows Program, I am ready to explore my leadership skills in this new setting through the implementation of new strategies, integration of company responsibilities and elevating brand recognition worldwide. Accepted: How did you learn about MIT Sloan? When did you know it was the right “fit” for you? Asha: I learned about MIT Sloan from Linda Abraham, Founder and President of Accepted. When she heard of my career trajectory and potential school choices, she recommended the Sloan Fellows Program. I am so glad that she did! From reading about their mission of “developing principled, innovative leaders who improve the world and to generate ideas that advance management practice” to their action learning labs, I realized that MIT Sloan was the “right fit” for me. The program duration of one year, the ability to cross-register for courses across MIT and Harvard as well as the location in Cambridge, MA added to the decision. Furthermore, I was awarded a partial Forté Fellow scholarship, which was a great bonus to the whole package. Accepted: Tell me about the application process! Did you experience any hiccups or challenges along the way? How did you overcome them? Asha: One week before I submitted the application, I attended a dinner with the program director and a few alumni. It was a great way to learn about the program, ask candid questions and see the dynamic between Sloan Fellows. One of the alumni in attendance offered to review my essays, which was very helpful. I also purchased the Application Final Check package from Accepted to ensure that my entire MIT Sloan application was perfect. A couple of months later, I attended an open house to see the campus, meet other candidates and ensure that MIT Sloan was indeed the right choice for me. Finally, I had my interviews via Skype with the admissions director and program director. Accepted: Looking back, how did you prepare for the GMAT? Did you feel the best prepared on test day? Asha: I was able to take advantage of a GMAT waiver as part of the MIT Sloan Fellows Program application process. However, I understand that the program no longer accepts waivers. Applicants now have to take the GMAT or the Executive Assessment. Accepted: What was your favorite part about MIT Sloan’s MBA program? Asha: The best part of the MIT Sloan experience are the people. The students are going to have impact on our world – you see this behavior in their daily actions. I found the environment at MIT Sloan to foster leadership opportunities. For example, within my program, I was elected by 40% of the class to represent them on the Sloan Senate (student government). Then, with another Sloan Fellow, I co-founded and presided over the MIT Sloan Infrastructure and Project Finance Club, which hosted a dozen events for its 250+ members (it grew to be one of the top 10 MIT Sloan clubs by membership). Finally, I worked on two early stage tech startups with my Sloan Fellow classmates, solving education (BuscaTuClase.com) and transportation (Pirca) issues in Latin America. We conducted primary and secondary market research, participated in contests/pitch events in the MIT entrepreneurial ecosystem and launched pilots in local communities. Accepted: Lastly, can you share a few tips for those students who are just starting out on their business school journey? Asha: If you are a woman, please consider participating in the Forté Foundation MBA Launch Program. It is a well-planned 10-month journey through the MBA application process with like-minded women. Also, based on the MBA Launch Program advice, you may find it easier to prioritize 1) taking the GMAT, 2) focusing on the application, then 3) scheduling the school visits. Want to learn more about Asha? You can follow her on Twitter. Thank you Asha for sharing your story and advice – we wish you much success! For one-on-one guidance on your b-school applications, check out our catalog of MBA admissions services. 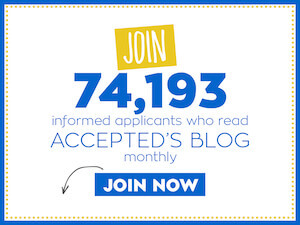 Do you want to be featured in Accepted’s blog? If you want to share your b-school journey with the world (or at least with our readers), email us at bloggers@accepted.com. Last updated on November 5, 2017.